If you are searching for a safe and reliable dog run fencing system for your dog or pet then Best Friend Fence has exactly what you need. Due to the lack of dependable dog run fencing products that were on the market and unfortunately still in existence today, we decided to offer a permanent solution to the problem. Using the safest and most durable materials, we were able to construct a dog run fence that is going to keep your dog or pets in a large contained area where they are free to run and play. Unlike other dog run fencing products, you are not going to have to worry about your dog being able to escape or other animals being able to enter your property. If you would like to purchase one of the dog run fencing products from Best Friend Fence please click here for more information. At Best Friend Fence our goal was to provide dog run fencing that would provide a safe and humane way to keep your dog or pet in a contained area. We needed to use fencing material that was strong enough to keep your dog from being able to chew or dig through the fence. It also had to be strong enough to keep large size animals, such as deer, from being able to enter your property. To keep deer out, we recommend that you install you fence at 7 feet high so that deer are not able to jump over the fence and your dog is not able to climb the dog run fencing as well. If you have any questions about our dog run fencing please make sure to contact us and one of our friendly staff members will help you. Although there are many available options that work to keep your dog securely contained within the boundaries of your property, there are few that are as genuinely safe, humane, and effective as our Best Friend Fence dog run fencing. 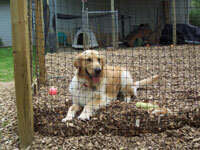 There is a reason why people choose our dog run fencing products over underground dog fences and electric dog fences. Both of these other ways are not safe or humane ways to keep your dog in a contained area. Underground dog fence systems require that your dog is shocked over and over again so that they learn the boundaries of the fence. This system is not only inhumane but also not always effective. If your dog wants to escape badly enough, he or she will brave the pain and overcome the barrier. Electric dog fences keep your dog in a contained area by shocking your dog anytime they try to escape. Your dog also has to wear a special collar each time they go outside. Best Friend Fence dog run fencing does not incorporate either of these methods. Instead, our dog run fencing is made from UV resistant black polypropylene recycled plastic and it creates a safe dog run that allows your dog to run free and leaves you confident that your pet will remain safely enclosed. Call today and see why people have been raving about our dog run fencing and all of the benefits. Please make sure to visit our dog fence kits section for more information if you are ready to purchase one of our dog run fencing kits. We want to provide you with as much information as possible so that you know exactly what you want to purchase and which solution is right for you and your dog. If you have any questions or feedback about any of our products or accessories, please make sure to contact us today. Below we have highlighted even more reasons why people use our dog run fencing system. Even when you are as close as fifteen feet away from our dog run fencing products, it is still very difficult to see. We specifically used certain materials and colors in order to make the fence difficult to see from close distances. This ultimately helps to ensure that our dog run fencing will not take away from the landscape and beauty of your home or property. Dog run fencing from Best Friend Fence alleviates the concerns of homeowners that fencing on their property will be obtrusive and confining. When you install a Best Friend Fence, you will hardly know that it's there at all. Our dog run fencing almost magically disappears on your property. When you purchase one of our Best Friend Fence dog run fencing kits you will receive everything that you need to install a complete fence enclosure around your home or property. 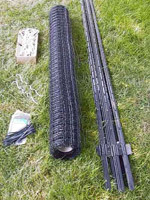 All of our kits include fencing material, support posts, zip ties, and ground stakes. The dog run fencing kits also have a set of detailed instructions which are very easy to understand and will guide you with our simple step by step process. We have thought of everything in order to make the delivery and installation process as simple as possible for homeowners. In case you need any of the available accessories during the installation, please call and a sales representative will guide you through our various options. When you have your dog or pet in our dog run fencing containment system, you will feel safe knowing that they will not be able to escape. We offer the most trusted and humane way of keeping your dog in a safe and secure environment. Unlike electric dog fences, no shock or pain that will be caused to your pet and our dog run fencing also protects against other animals entering your property. No other product on the market offers the same kind of reliability and safety as our dog run fencing. We have listed many of the reasons that people choose to use our dog run fencing kits and we invite you to do the same. 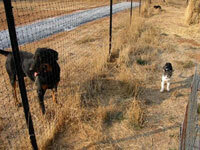 At Best Friend Fence we give your dog or pet the ability to run and play in a safe and secure environment. You will never have to worry about your dog being able to escape or other animals being able to enter onto your property. If you have any questions about our dog run fencing please feel free to contact us.